One of the most prevalent flavor combinations on this blog is chocolate and mint, and there's a very specific reason for that--I love it. The refreshing breeze from the mint seems to perfectly complement the rich depths of chocolate, regardless of the vehicle in which they're traveling. This vehicle is particularly decadent. There's chocolate everywhere and in three different forms. 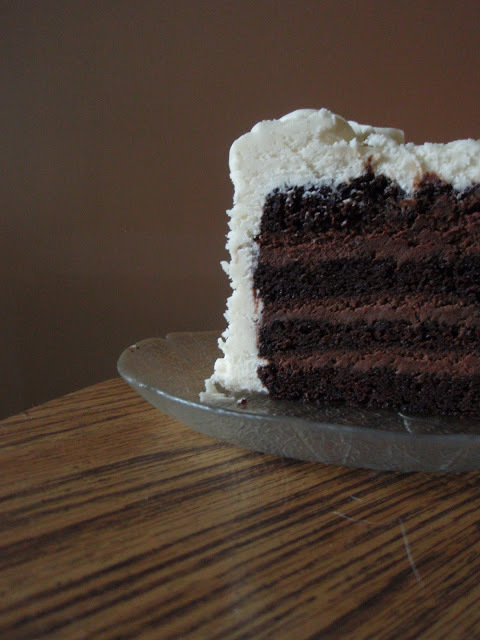 The foundation is a moist and fluffy cocoa-based chocolate cake that's coated in an amazing white chocolate buttercream frosting (s. woon.) and filled with clouds of mint-flavored chocolate mousse. Each bite is an exciting and enjoyable sensation. If you're a fan of the marriage of chocolate and mint like I am, give this cake a try. It's magnificent enough for any occasion, even if said occasion is as trivial as, say, the sprouting of a new gray hair. Prepare your chocolate cake and bake it in two 9-inch round pans. Once cool, cut each round in half horizontally. To prepare the mousse, carefully melt the chocolate and set it aside. Place the heavy cream and sugar in the well-chilled bowl of an electric mixer fitted with the chilled whisk attachment. Whisk on high-speed until stiff peaks form. Remove the bowl from the mixer. By hand, whisk to combine 1/4 of the whipped cream into the melted chocolate until smooth and completely incorporated. Add the combined whipped cream and chocolate to the remaining whipped cream and use a rubber spatula to fold together. Stir in the extract. To prepare the frosting, put the chopped white chocolate into a small bowl and heat it in 30 second increments in the microwave. Stir after each increment, and continue to heat 30 seconds at a time until the chocolate is melted and smooth. Set aside and allow to completely cool. Cream the butter and add the sifted powdered sugar, beating until light and fluffy and scraping the sides and bottom of the bowl as needed. With the mixer running on low speed, gradually pour the cream and vanilla into the bowl. Once the cream mixture has been incorporated into the frosting, fold in the melted and cooled white chocolate until incorporated. Increase the mixer speed to medium-high, and beat the frosting for an additional 3 minutes. To assemble the masterpiece, slather the mousse between the halved layers (stacking as you go), then frost the sides and top in a decorative fashion. Chill for a bit to let things mingle, then slice and serve! A very tempting cake! So beautiful. This looks really good! Chocolate and mint is a favorite flavor combo of mine, but I like that the frosting is white chocolate. I'm pinning this! After this...I'll never be able to make another chocolate cake again. In.Love. I will have to make do with "thin mints" and mint patties fir now but this does sound delicious. Yum! I need this cake now....I'm having a chocolate craving today, and need a fix soon. Your cake is calling to me Grace-it's beautiful and decadent looking. So extravagant and tasty looking! Nw to find the occasion :) You knocked that flavor combo and cake out of the park Grace! You had me at chocolate-mint mousse. Seriously? Sounds incredible and as a fellow lover of chocolate and mint, I am in awe of this concoction! And while I am not a big chocolate fan, I do love it with mint...especially peppermint. This is some kind of cake...very elegant, Grace! Now that is one magnificent cake Grace! While this cake sounds decadent and delicious, in my mind you and cinnamon as inseparable. Bookmarked for my husband and daughter. They both love the mint/chocolate combination. It looks beautiful Grace. gracie you were mint for me. I am sooooo with you on the whole chocolate and mint thing!! Your post title is great, too. This might actually be the cake to end all cakes. Chocolate, white chocolate, and mint all in one place is a place I want to be! Love the layers of mousse. I almost choked on my lunch when I read that last line. Your posts are always good for a smile. :) This cake, on other hand, is good for eating. Lots and lots of it if I have anything to say about it. Another wonderful recipe. YOu come up with the most cleaver titles! Who isn't a fan of chocolate and mint??? Crazy people, thats who! Hubba Hubba!! and how cute are you with that title!!! Mint is a favorite of mine and this looks delicious!! Oh my, you nailed it with this flavor combination! The frosting sounds and looks so good with this combo! Bravo! I looove chocolate & mint, and I can't wait to make this. Lovely photos, too! I, too, am a big fan of chocolate and mint together. It's such a great combination. This cake looks scrumptious! Its a thing of beauty, really! There is no better mate in my book than mint. Raspberry and peanut butter partners are a close second but mint is my tops. I would love this cake- I know it. Look awesome, love this Grace!! I am a chocolate 'n' mint fan too and this cake looks over the top gorgeous. nice job as usual! Sometimes I'll put a mint buttercream frosting on chocolate cake, but what everyone loves is yellow cake with mint-chocolate buttercream frosting. 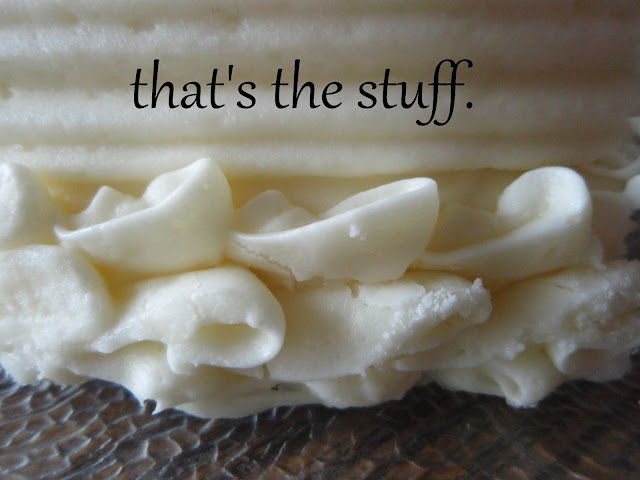 They'd probably love your beautiful layer cake, too. Count us as a family of chocolate/mint combination lovers! what a delectable combination, buttercream is one of my favorite frostings. Such a beautiful looking slice! Stunning cake, Grace. The White Buttercream Frosting is the "icing on the cake." With all of that chocolate, and a little bit of mint, how could it be anything but perfect? i LOVE mint... I need this stat!! another winner!! Yes, yes a great combinatin! Such a fantadtic looking cake...can't wait to try it! That looks like a Southern Living cover! I am in love! what can I say! added you to my Google reader! What a beautiful cake, and I never can resist the combination of chocolate and mint. Oh my! Grace, that is indeed a delightfully decadent masterpiece!!! I love mint and chocolate too, especially mint patties :) The white chocolate frosting though is what's catching my eye, it looks dreamy. I am such a fan of chocolate mint too! I love absolutely everything about this!